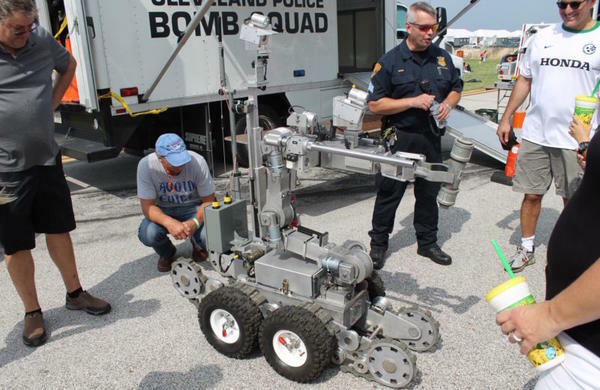 Police in Cleveland show off their bomb squad robot. While police, media, and citizens piece together the details of the shooting of police officers in Dallas last week, we still are left with many questions. One of which surrounds the use of police tactics. In a never-before-seen measure, Dallas Police Negotiators used a robot armed with a bomb to end a prolonged standoff with the shooter. That tactic has now called into question the legality of such weapons and their deployment. Philip Lyons, College of Criminal Justice dean at Sam Houston State University, says the difference between using a robot and ambushing a suspect with guns is that it’s unprecedented. “The police have used bombs at least on one other occasion that I'm aware of, but didn't do it remotely through the use of a robot," he says. In one 1985 case, Philadelphia police dropped a bomb on a home occupied by the MOVE organization. The police and the organization had been engaged in an active firefight for some time before police made the decision to drop the bomb on the home – but it wasn't the only building destroyed. Neighborhood homes near the bombed site caught fire, and some children were killed. The neighborhood was primarily African-American, which did not bode well for the police. Lyons says it is possible that the similar case of a gunman targeting police officers in Dallas last week could open the door for more incidents involving technology to catch a perpetrator. "We're going to probably have to have some conversations around that possibility,” Lyons says. “Obviously technology is advancing and sometimes the law and policy and practice struggle to keep up with that in ways that are acceptable to the communities that we serve." Lyons says one of the chief concerns of using a robot with a bomb attached to its extension to kill a suspect is the optics. "It's going to be perceived by many people as a step toward greater militarization of the police,” he says, “and may intensify the view that some people have that the police are at war with them." Is this use legal? Lyons says this is something for the courts to decide. "In this case it will probably turn on the Fourth Amendment to the U.S. Constitution – which prohibits unreasonable searches and seizures,” he says. “I think that the courts would probably construe the shooter to have been in constructive custody – that is, even though he was not physically in the custody of the police, his freedom of movement was so restricted. Whenever someone is in police custody, constructive or actual, the police have to behave reasonably." But a lot of the legality of the case boils down to perceptions, Lyons says. “Obviously police officers were in harm's way, so I'm sure the decision was made on the basis of trying to minimize the exposure of officers to danger,” he says. “There are, however, other considerations. ... The only two times in American policing history that bombs have been deployed (they) have both been deployed against African-Americans - even though African-Americans are only 12 percent of the population. If this is going to fuel those feelings further, might it be case that the short-term benefits of minimizing harm to officers may be offset by greater long-term consequences as other people may decide to take up arms against police." 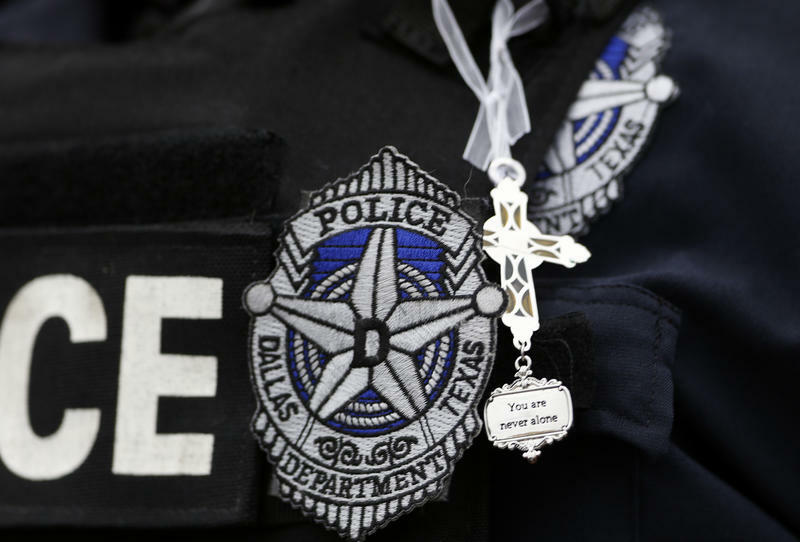 The calculated killing of five uniformed officers would be traumatic for any metropolitan police department in America, but it has fallen especially hard in Dallas, where the police force already suffers from low pay and poor morale. Citizens in Dallas are rallying around their officers in blue, suggesting the events could be a turning point for the embattled department. The Thursday night shooting that left five police officers dead in downtown Dallas, and the recent killings of black men by police in other cities, have many on edge. KERA talked with African-Americans in downtown Dallas about how they’re feeling in the aftermath. In a press conference Monday morning, Dallas Police Chief David Brown provided several updates on the shooting, the killing of suspect Micah Johnson and the ongoing investigation. 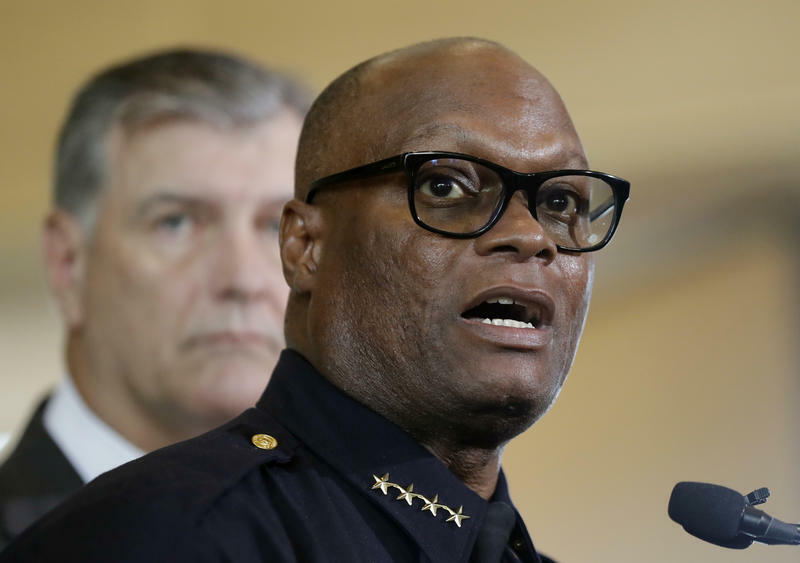 Dallas Police Chief David Brown held a wide-ranging press conference on Monday, where he touched on race, the investigation and the issue of guns. In a dramatic moment, he urged legislators to do their jobs and propose new laws to combat gun violence. "We're doing ours. We're putting our lives on the line," Brown said. "The other aspects of government need to step up and help us."